The thing that makes the biggest difference in helping foster youth succeed is the support they get from caring adults. This is what youth in the foster care system said during a recent discussion at UCLA, which was sponsored by the UCLA School of Public Affairs. Foster youth age out of the system and are on their own, which is called emancipating, at age 18. They are often not prepared to live on their own and don’t know about services they’re eligible for, like housing and college financial aid. 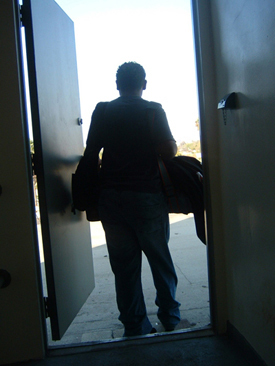 Nearly half of foster youth emancipate without completing high school. Within 18 months of emancipating, 20 percent become homeless. California is considering letting youth stay in foster care until age 21. This would help them stay connected to the caring adults and services that are crucial to their success as they become adults. All of the foster youth on the panel thought that was a good idea. The following are selected comments from six current and emancipated L.A. County foster youth, who spoke on a panel about aging out. What are your goals? Who’s helping you reach your goals? Naomi: I’ve been in foster care all my life. [It’s been] rough because most of the foster parents I was with was just there for the money. I think about becoming an adult all the time. U.J. : I live with someone that really cares. My foster mom talks to me about [being on my own] and my grandmother, they prepared me. Gardenia: My plans for the future are to graduate from high school and apply to Pepperdine or Princeton University. Since the beginning my foster parents, they’ve always been there for me. They advise me. My school, they also prepare us for college by giving us college classes at Trade Tech. Stephen Conteh (UC Davis graduate): It’s a scary world out there once you’re out of the system, the real world. All the different things you have to do, paying your bills. I had no idea what life was going to be like after foster care … My social worker helped me quite a lot … My high school college counselor was very instrumental in making all the information available to me, all of the fee waivers and the different things that helped me with the SATs and applying to all the different schools. I credit her with the 25-plus schools I was able to get into. Ashley D. Williams (UCLA freshman): I was always a determined kid. I refused to be like my family. I saw myself going to college and doing something big with my life. … I was living in a foster home for about two to three years. My foster parent learned that she was no longer going to be getting a check for me. One day I came home and all my things were put out on the porch. I had always had a mentor. When I moved out that was the first person I called. Eventually I moved in with her before I moved onto campus at UCLA. Jasmine Reynolds (San Diego State graduate): Michael Williams, he’s the social worker of the year, of the decade. He still calls me to this day and I am 25. Before I had him we had a social worker that did not come at all. United Friends of the Children, they’re a nonprofit organization. They helped me with a scholarship. They sent cards, asked how I was doing. That’s very helpful too because when you don’t have a supportive family who’s encouraging you but you have outside people, that definitely helped me. How can the foster care system help youth succeed? Gardenia: I think that they [foster youth who have aged out] go to a shelter or they’re just in foster care not knowing what to do because of the lack of information. I think that’s what we need. Stephen: In a foster home where it’s just business they only do the bare minimum that’s required of them. … The foster home I was at there were four boys and only two of us ended up going to college. It’s not the fault of their own but the lack of support and lack of structure around them. I guess the only difference is I had a great social worker. Ashley: I’ve lived with a fistful of broken promises. I think it needs to be mandated that you have some type of support system in each foster home and each group home. And it’s not just about a check but it’s about them [the kids]. Jasmine: Being supportive, having someone that sticks around and who is a woman or man of their word. My mentor and all the people in my life have been consistent and I think that’s very important. … Once you are emancipated they have housing programs for low-income people. A lot of people don’t know that so they go out in the streets. That goes back to the social worker and the lack of information they have. There are a lot of transitional living [housing] programs all over L.A. and a lot of people don’t know about that. Should foster youth be able to stay in the system until age 21? Naomi: When they turn 18 some of them don’t have a place to go. Some of their families turn their backs on them. Gardenia: Even if we go off to college we still need the support. I met this person who was 18 and he didn’t know what he was going to do with his life so I think it’s really good if you can stay in the foster care system until you’re 21. Ashley: I think it’s really great because nobody puts their real kid out at 18. It’s being realistic. Jasmine: I’m happy because right after I graduated from high school I went on to San Diego State and I didn’t have any money toward my housing. I went to court and I fought. I was like, “I need some more money.” They had expensive rent for $900. I couldn’t work at the time. They’re like, “We can’t do it, you’re 18, we can’t keep you on the services.” I fought and they appealed it for six months. That extra money came in handy. Dear readers, we need your help. Stories about the challenges facing foster youth have been a key part of L.A. Youth’s mission since 2003. To help ensure that we can keep publishing stories about the true experiences of youth in care, please donate to L.A. Youth.